Today was the second day of Star Wars Celebration 2017, and to kick off the festivities, fans the world over were treated to a fantastic panel for the upcoming saga film, Star Wars: The Last Jedi. The panel, moderated by Star Wars super fan Josh Gad, featured LucasFilm president Kathleen Kennedy and The Last Jedi director Rian Johnson as they chatted about the new film. We also got to see some stars of the film, including Daisy Ridley, John Boyega, newcomer Kelly Marie Tran (who plays a new character named Rose), and of course, Luke Skywalker himself, Mark Hamill. It was an amazing panel and Josh Gad killed it as moderator. We got our first look at the official teaser poster (seen below), and the thing we've all been waiting for, the very first teaser trailer! So without any further ado, here is the trailer for Star Wars: The Last Jedi and my subsequent review. Enjoy! What a fantastic first look at the next chapter in one of the, if not THE greatest franchise in cinematic history. This trailer gave us everything we could've asked for: Rey and Luke, Poe and BB-8, Finn, Kylo Ren, Leia (albeit just the back of her head), awesome ships and great space battles. What more could we want from a teaser. 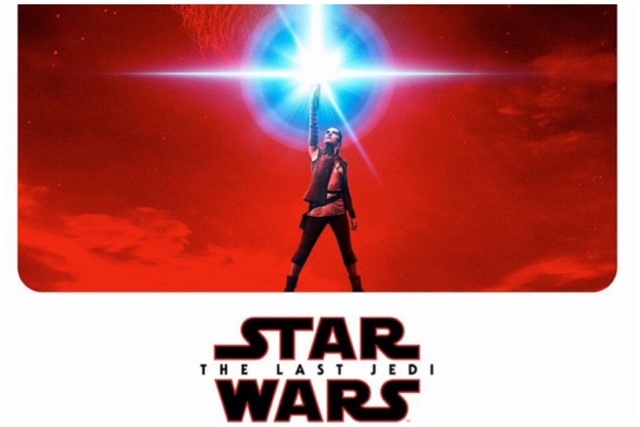 The trailer starts off with our new favorite heroine, Rey, as she delves into her Force training with Luke. We hear him telling her to breathe, and we get some gorgeous shots of the island that Luke has been living on. Then, at the 40-seconds mark, we get one of my favorite shots in the entire trailer when the rocks rise from the ground. It's such a beautiful and powerful shot and I can't wait to see it on the big screen this December. From there we get some quick teaser shots such as Leia at what looks like a command center and a shot of Vader's destroyed helmet. And then there's a shot which, until I took a screenshot and zoomed in, I wasn't quite sure what I was looking at, even after several viewings. It appears to be a group of old books (possibly old Jedi Order tomes), which would make sense with the following scene of what I assume is one of those books with the Jedi symbol. Next we see a quick distance shot of Rey training with a lightsaber as Luke looks on. I'm really looking forward to seeing the up close version of this scene in the film. Then the beautiful score kicks up and the action begins. We get some great new ships in another beautiful shot (this trailer is full of those), then we see Finn, who is still out of commission after the events of The Force Awakens. But he's not the only familiar face we see. From this point we see quick shots of all the characters we know from Episode VII. We see Poe and BB-8 running and almost getting blown up, Rey with her lightsaber, Kylo with his, and who I assume is Luke Skywalker with R2-D2, as they are watching a building burn (possibly a flashback to the destruction of his Jedi Temple?). We also get a very quick shot of Captain Phasma with some Stormtroopers, a scene I missed the first couple times. AND DON'T FORGET THE MILLENNIUM FALCON!!! I get giddy every time I see this ship appear on screen. And then there's Luke's line: "I only know one truth...it's time for the Jedi to end." WHAT DOES THAT MEAN?!? Is Luke giving up on the Order? Does he want it to evolve into something else? 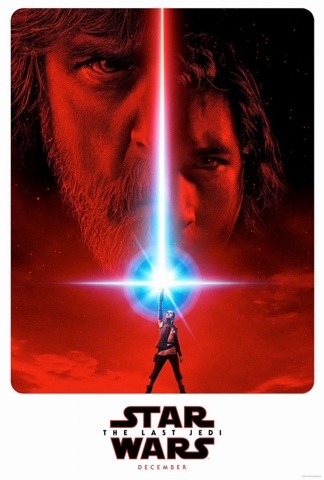 Will we possibly see a new version of the Jedi battle against the new version of the Sith (The Knights of Ren)? I guess we'll just have to wait until December to find out.